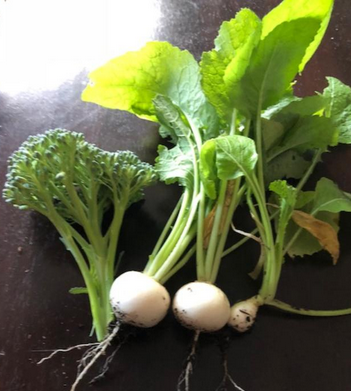 In addition to all the varieties and classifications for edibles we grow in our gardens plant may also be classified according to their seed source as Heirloom, Certified Organic, Non GMO, or Hybrid. 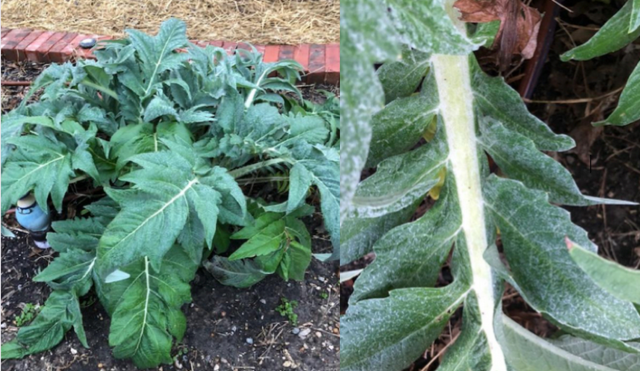 Although most of the plants growing in the Garland Community Garden are grown from heirloom seeds or heirloom transplants, we do have many plants that are also hybrid varieties. 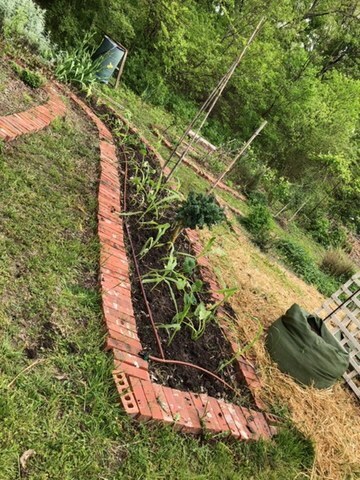 For example, we recently planted 42 Sweet Corn G90 transplants which are hybrids and our tomato population includes many varieties of Heirloom and Hybrids. As far as I know, we have no GMO plants growing in the Garden. Heirloom seeds are seeds that have been saved and shared by generations of home gardeners. (Heirloom seeds and plants are also most often certified organic--although not always as you can see by the definition below for "certified organic.") When we state that a variety is an heirloom, we usually mean that it is an open pollinated variety developed before 1940. You have the option to produce your own seed supply. Some crops, including beans, peas, tomatoes, and lettuce, are self-pollinating, and thus do not even require much isolation for seed saving. Furthermore, by selecting the best plants from which to save seed, anyone can adapt specific variety strains to their region or microclimate. Open pollinated seeds are less costly than hybrids. Few can ignore the superior flavor of many open-pollinated varieties. Many breeders who specialize in creating hybrid varieties for large-scale commercial growers tend to focus on qualities other than flavor, such as storage ability, uniformity, and characteristics more pertinent to processing. Suffice it to say that since the onset of modern hybrid plant breeding, flavor has not been a priority. Certified organic seeds and plants are grown in organic soil and are only exposed to inputs (like fertilizer and pest controls) permitted by the USDA’s National Organic Program during its growing, processing, and packaging periods. To qualify as "Non-GMO", the seeds must not have undergone “the mechanical transfer of genetic material outside of natural reproductive methods and between genera, families or kingdoms” as stated in the Safe Seed Pledge. The Institute for Responsible Technology offers these 10 good reasons for non-GMO. GMO's contaminate forever. GMOs cross pollinate and their seeds can travel. It is impossible to fully clean up our contaminated gene pool. Self-propagating GMO pollution will outlast the effects of global warming and nuclear waste. The potential impact is huge, threatening the health of future generations. Most GM crops are engineered to be “herbicide tolerant”?they deadly weed killer. Monsanto, for example, sells Roundup Ready crops, designed to survive applications of their Roundup herbicide. Government oversight is lax. Most of the health and environmental risks of GMOs are ignored by governments’ superficial regulations and safety assessments. The reason for this tragedy is largely political. The US Food and Drug Administration (FDA), for example, doesn’t require a single safety study, does not mandate labeling of GMOs, and allows companies to put their GM foods onto the market without even notifying the agency. Biotech companies like Monsanto told us that Agent Orange, PCBs, and DDT were safe. They are now using the same type of superficial, rigged research to try and convince us that GMOs are safe. Scientists who discover problems with GMOs have been attacked, gagged, fired, threatened, and denied funding. GM crops and their associated herbicides can harm birds, insects, amphibians, marine ecosystems, and soil organisms. They reduce bio-diversity, pollute water resources, and are unsustainable. Whereas sustainable non-GMO agricultural methods used in developing countries have conclusively resulted in yield increases of 79% and higher, GMOs do not, on average, increase yields at all. This was evident in the Union of Concerned Scientists’ 2009 report Failure to Yield?the definitive study to date on GM crops and yield. Because GMOs give no consumer benefits, if even a small percentage of us start rejecting brands that contain them, GM ingredients will become a marketing liability. Hybrid seeds are created by crossing two selected varieties, sometimes resulting in vigorous plants that yield more than heirlooms. Hybrids. This is not the same as GMO which involves transfer of genetic material which modifies the plant's genetic structure. They offer superior disease resistance. Hybrid seeds produce uniform plants and uniform fruits. This can make cultivation more efficient as well as provide reliability in marketing the end product. This is especially important for the commercial grower. In general hybrids will be more vigorous and produce higher yields. But as mentioned previously, taste takes a back seat to other qualities selected when crossing varieties. Qualities such as tougher skins to survive shipping and uniformity of shape. 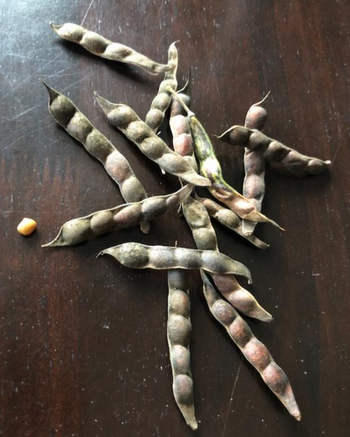 The primary disadvantage of hybrids is the seeds cannot be saved from year to year.Seeds saved from hybrid plants usually will not produce the same plant the following year because most varieties are not self-sustaining. 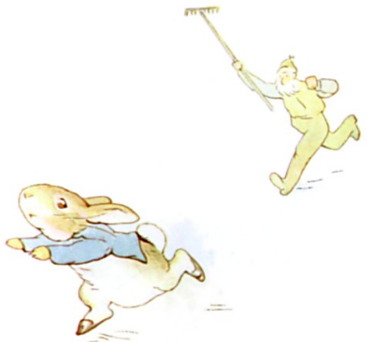 Drawing by Beatrix Potter from “Peter Rabbit.” Perhaps if Mr. McGregor had known how great rabbit manure was for his garden, he would have made friends with Peter and perhaps orchestrated a mutually beneficial arrangement. Rabbit manure is packed with nitrogen, phosphorus, potassium, and many minerals, lots of micro-nutrients, plus many other beneficial trace elements such as calcium, magnesium, boron, zinc, manganese, sulfur, copper, and cobalt just to name a few. And it won’t burn your plants. Fertilizers fall into two general categories: organic, or natural, and inorganic, or chemical. Most plants benefit from fertilizing. Natural fertilizers are those formed through decomposition of organic matter, while chemical fertilizers are manmade. Natural fertilizers improve the texture of the soil and increase the amount of beneficial microorganisms. Inorganic chemical fertilizers feed the roots of the plants and do little to improve the soil. Your plants are not going to know the difference between organic or inorganic nitrogen but the microorganisms in your soil will. Your plants will grow with the continued use of chemical fertilizers. However, continued use of inorganic fertilizers increases the gardener’s dependence on purchasing them again year after year because each year, the quality and texture of the soil will become worse as chemical fertilizers do not feed the microorganisms in the soil and they die off. Chemical Fertilizers Only Nourish the Chemical Content of soil. All soils consist of a chemical, physical and biological content. The chemical part refers to the nutrient content (nitrogen, phosphorus and potassium). This is the only part of the soil that is fed by chemical fertilizers. The physical part refers to the structure and texture of the soil (sand, silt, clay and organic material). The biological component includes the fungi, bacteria, protozoa, arthropods and other micro-organisms. Organic Fertilizers nourish all components of the soil as they feed and encourage micro-biological activity. The Micro-organisms are the biological content of soil. Mycorrhizal fungi attach themselves to plant roots and increase the absorptive ability of roots by 10 to 1,000 times, resulting in an increased drought tolerance. Mycorrhizae also release antibiotics into the soil that immobilize and kill disease organisms. They also are capable of releasing powerful chemicals into the soil that dissolve hard-to-capture nutrients, like phosphorus and iron. They can also help improve soil structure by supplying organic “glues” that bind soil particles into aggregates, thus, improving porosity. Soils with poor porosity tend to become waterlogged and disease-prone. As you can imagine, these little guys do a tremendous job of keeping our plants healthy and thriving. All soils contain both bacteria and fungi, and both can be either beneficial or pathogenic. It is our job as gardeners to encourage the good guys. We do this through gardening practices like annual applications of compost, crop rotation, minimal applications of pesticides, no-till gardening techniques and good water management. Biofertilizers contain different types of fungi, root bacteria or other microorganisms. They form a mutually beneficial or symbiotic relationship with host plants as they grow in the soil. Biofertilizers are a cheap, easy-to-use alternative to manufactured petrochemical products. Biofertilizers restore normal fertility to the soil and make it biologically alive. They boost the amount of organic matter and improve soil texture and structure. The enhanced soil holds water better than before. Biofertilizers add valuable nutrients to the soil, especially nitrogen, proteins and vitamins. They take nitrogen from the atmosphere and phosphates from the soil and turn them into forms that plants can use. Some species also produce natural pesticides. Biofertilizers increase yield by up to 30 percent because of the nitrogen and phosphorus they add to the soil. The improvement in soil texture and quality helps plants grow better during periods of drought. Biofertilizers help plants develop stronger root systems and grow better. Biofertilizers also reduce the effects of harmful organisms in the soil, such as fungi and nematodes. Plants resist stress better and live longer. The soil must contain adequate nutrients for biofertilizer organisms to thrive and work. Biofertilizers complement other fertilizers, but they cannot totally replace them. Biofertilizers lose their effectiveness if the soil is too hot or dry. Excessively acidic or alkaline soils also hamper successful growth of the beneficial microorganisms. NOTE: I’ve never used a biofertilizer before but I just ordered a gallon bag for the Garland Community Garden. This comes with no recommendation on my part: Wakefield Biochar Soil Conditioner one gallon bag from Amazon for $17.99. I’ll apply to Charlie’s tomatoes at the garden and then to one of the tomato plots he has at his house. I’ll let you know how they grow. Use about two-thirds brown matter –pruned branches from shrubs, dry leaves, animal droppings and so on – and one-third green-matter, such as food scraps, green leaf litter and grass. Water your compost well and make sure it is aerated. Soon bacteria and microorganisms will colonize your compost pile and turn it into useable material for adding to your soil. Organic mulches such as straw, grass clippings, newspaper and woolen clothing break down more slowly than other forms of organic matter, but they offer other benefits that make them incredibly useful. As they slowly break down, releasing nutrients back into the soil, they provide insulation from extremes of temperature, cooling the soil in the summer and keeping it warm in the winter. They also help retain moisture in the. And, they act as a weed barrier or to cover existing weeds and break them down into organic matter. Legumes are the family of plants that have the best nitrogen-fixing ability. Certain bacteria that live in their roots convert nitrogen into a soluble form of the element that plant roots can take up and use to grow. 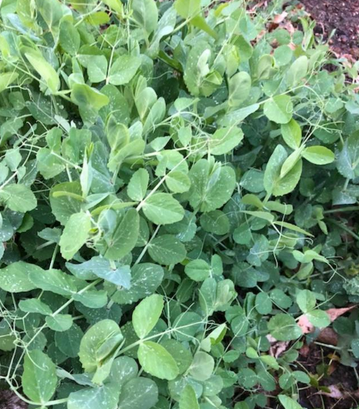 At the garden we grow Austrian Winter peas as our cover crop. Cover crops serve a lot of functions. They help to minimize water evaporation from the soil, they provide shade and, importantly, they add organic matter. This is because cover crops, such as potatoes and pumpkin, have deep roots that open up the soil, allowing water and nutrients to penetrate into it and stimulating microorganism activity. These roots also help maintain the integrity of the soil, and the leaves of cover crops rot in place and return their nutrients to the topsoil. Green manure crops are similar to cover crops, but rather than remaining in the soil and naturally decaying in winter and revitalizing in spring, they are deliberately cut and then left on the surface or forked into the soil to add organic matter. My own personal preference for animal manure is that it is fully composted and broken down from several months in the compost pile prior to use in the garden. At the Garland Community Garden we currently use only horse manure. Certain manures such as horse, rabbit and alpaca can be applied directly to the garden soil without danger of burning the plants. This is not true of other manures such as that from a cow, pig or chicken. EASY GARDENING CONTINUED. . .
With wire container gardens you can garden until you die if you want. With this garden design people in their 80’s and 90’s can still garden. If you can walk or get about in a wheelchair you can garden following this method. If you are a busy person with little time to garden, you still will have enough time to garden using the wire container method because there is little to no weed pulling and very little time spent watering. 2. Make a 3.5 x 3.5 foot wire container. Choose a sunny spot in your yard. For markers, find four rocks, or tiles or bricks. 1. Place markers at the approximate four corners of a square with 3.5 feet sides. 2. Use the tape measure for indicating the exact distance of 3.5 feet and move your markers accordingly. 3. Pound each of the four rebars 12 inches into the ground at each of the four corners. 4. Wrap the wire mesh around the outside of the four rebars. 5. Secure two ends with tie wraps and wire. Use five-foot rebars. Drive them a foot into the ground. This will leave a foot of rebar over the top of the wire mesh. In January you can duck tape cardboard over each of the four rebars (so the rebar won’t cut plastic sheet) and lay a heave gauge clear plastic over the entire bin, securing at the bottom with duct tape and you have a greenhouse to start plants for the spring. Fill the wire container with growing medium. Rotten logs (not totally necessary but good addition). Composted soil (about 10 gallons) – Purchase a medium bag of garden soil or mooch some compost from a friend’s pile. Put the logs/wood in the bottom first if you have them. Logs are good especially if they are rotten as they will hold and release moisture. Put a layer of mulched leaves on top of the logs. Hay is also good. Some say it contains a lot of seeds but Ruth Stout wouldn’t agree. 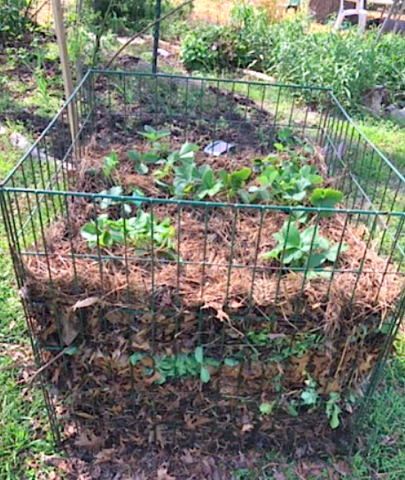 Put a layer of green manure (green leaves spoiled fresh produce (no meat or cooked veggies) on top of the brown. You can also add rabbit or horse manure. One of the best things about rabbit manure is it doesn't need to be composted. Rabbit manure is organic matter and improves poor soil structure, drainage and moisture retention. ... Rabbit manure is higher in nitrogen than sheep, goat, chicken, cow or horse manure. Plants need nitrogen to produce strong green growth. Continue layering and watering each layer until near the top of your container. Top off your container with about 6 inches of garden soil or composted soil. Now for the fun part: You don’ t need a shovel or a hoe. You don’t need to make your back sore bending over. All you need is about a six by six inch square of garden soil for each plant. Scoop out a hole in the top of your garden plot. Imagine it as a pot for your transplant. Put some of the soil in the hole. Insert the plant. Put a little more soil around it to secure it. Water. Repeat for all transplants. The process is similar for seeds as well. When finished. Use hay, straw or wood chips to mulch around the top and give one final water application. Like all gardens you should check it daily—if for no other reason than to make yourself feel good and accomplished. During the first three weeks after planting, stick your finger into the soil up to about the knuckle of your middle finger. It should be moist. After the plants have a good start and your seeds have grown their first set of true leaves, you may only need to water once every two weeks. Here is another test: When it is really hot, towards the end of the day you can expect your plants to droop. However, in the early morning if they are still droopy, they need to be watered. Another great feature of these beds is that if you want to move a plant over to make room for another one, you can do this in a matter of seconds without harming the plant. Make a hole in the bed with your hand where you want to move the plant. Then using both hands scoop gently underneath the plant down to about the area where you think the roots will be extended and lift up and transfer to its new spot. Fill in the hole you left with some soil and put your new plant in there. As time goes on you will find the level of your garden sinking. Use your hands to dig in places between the plants and insert a mixture of brown organic matter and spoiled produce. Make sure to cover well with brown organic matter such as leaves or hay. I’ve known of Ruth Stout’s methods for years. Ms. Stout was known as “The Mulch Queen.” Ruth Stout was born in the United States in 1884. As early as 1920, she realized that all traditional methods of working with the soil (digging, weeding, watering, plowing, hoeing) could be replaced by simply adding layers of hay on the ground. She wrote about this particular organic approach from 1953 to 1971. Stout emphasized the simplicity of her methods, and the way the gardener benefits from extra free time and rest. It’s easy to see with the titles of her books: Gardening Without Work, I’ve Always Done It My Way, and How to Have a Green Thumb Without an Aching Back. I’ve also known how composting works—at least for a small-scale garden. If you have some partially rotten (untreated) wood, lay on the bottom. You put a layer of brown organic matter such as leaves, straw or hay (about four inches high) a layer of green (about two inches high). A thin layer of fresh produce such as carrot peelings, cabbage gone bad in your bin, rotten tomatoes, etc. Then start all over with a layer of brown organic matter and continue until the compost pile is as tall as you want. If you do it this way, you do not have to turn the pile. You make holes with your hands in the pile about 18 inches deep and 8 inches in diameter, fill with rich soil, and insert your transplants or your seeds. The missing element to Ms. Stout’s method is an enclosure for the compost. I like an enclosure because it discourages animals, makes it easier to tend your plants as you don’t have to bend over, and it looks nice. You want a wire mesh enclosure so the compost can “breathe”. With a solid enclosure, heat will build up within the pile and it may get too warm for your plants. You may also want to make a wire mesh cylinder for the center of your enclosure to increase the aeration. You can also use this cylinder to continue to feed your bed by tossing rotten fresh produce into it (covering each time with hay or other brown organic matter such as leaves so you don’t attract critters). As you can see from the photo (and in person if you visit the Garland Community Garden) I’ve used some wire compost containers that we donated to us. However, you can make your own enclosures easy enough: 1. Four rebar about 4.5 feet tall 2. Steel gauge wire mesh. -- Mark off equidistant four spots to form a square. Drive the rebar into the ground at each of these four points. Wrap the wire mesh around the rebar, folding at the corners. Use tie-wraps to connect the wire mesh at the final corner. Make your wire cylinder (about 10 inches in diameter and a little taller than your bin) and place in the middle. Then make your layers. 4. a bed that is easy for people in their 80’s and 90’s to tend. NOTE: If raining in the morning may be postponed until the Afternoon. If raining in the Afternoon, stop by from 1 to 4 PM on Sunday April 7. I was down at the Garland Community Garden today--didn't find a four-leaf clover, but I felt lucky nonetheless. it was a beautiful day and I was heartened to see six gardeners working away. Earlier this morning I helped some folks unload horse manure down there and went down to check on our tulip bed which i part of a citizen science project tracking climate change in North America. 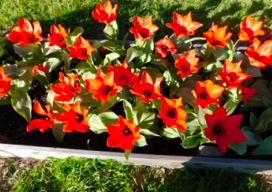 The tulips were planted on January 8, 2019 according to instructions we received from Journey North. 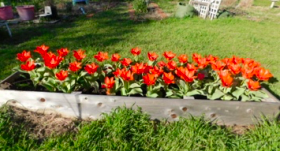 All 50 tulips we planted came up. The first ones began to emerge by February 11. 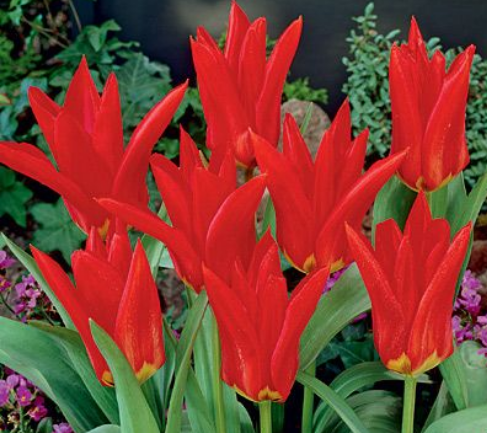 By February 22, all 50 tulip bulbs had emerged. March 2 saw our first bloom. By March 11 all 50 were in bloom. Today I took the final snapshots shown below. On March 17 all are in full bloom--almost read to shed their petals. The Winter Solstice event hosted jointly by Loving Garland Green and the Garland Area Makerspace was a success. 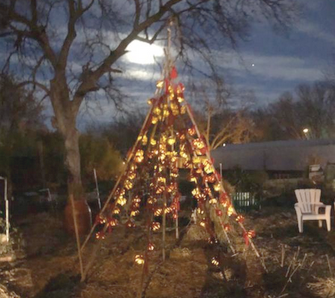 Instead of stockings, lanterns (made from recycled soda cans) were hung with care at the Garland Community Garden. 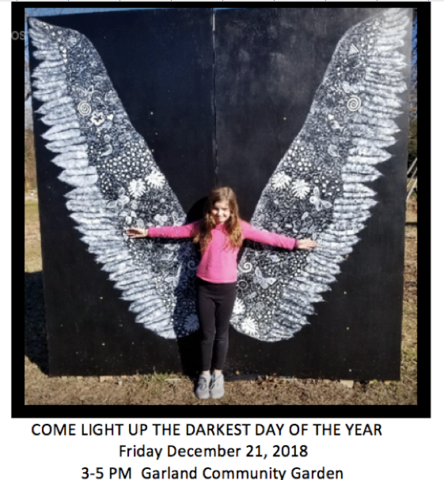 In addition to adding lanterns to the tree, visitors took their photos and photos of their children in front of "Garden Wings",, a participatory art installation at the garden. 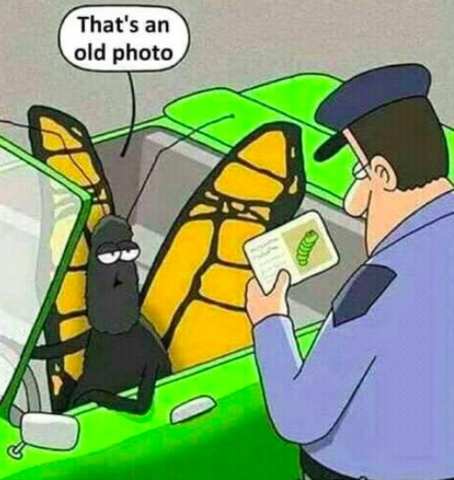 While we can't guarantee this will make them better gardeners in 2019, it will remind them that we often soar to new heights on wings of knowledge, experience and caring from others. You are invited to join members of Loving Garland Green and participate in the first Wings for Our Community event. “Wings” was born as a fundraiser concept for the Garland Area Makerspace. Loving Garland Green, stewards of the Garland Community Garden, are supporting us in testing Wings. Our idea is to put wings all over Garland. People can pose with the wings and donate money to help manifest a space for the Garland Area Makerspace. As our concept broadens and becomes more community inclusive, it has occurred to us that any nonprofit in our community can also have their own wings. Each pair of wings will be unique to the maker/artists, but they will all loosely follow a format of being 8 feet tall and with feathers for their outer edges. The body of the wings will consist of related objects. For example, Garden Wings, shown above has various representations of organic matter. Soon we will have a pair of “Maker Wings.” These wings will feature people and tools. The idea behind "Wings" is remembering and recognizing all the wings we are given in the form of people and tools that enable us to soar to heights we might otherwise have never been able to. At this event, each person who wants to will be given a lantern and an LED candle to put inside the lantern and attach to a structure in the garden. These lanterns are in remembrance and gratitude for people in our lives who have provided wings for us to soar. There will also be markers at the event for those who want to write the names of these people on their lanterns. Note: If it's rained more than an inch in the last 48 hours, park on Kingsbridge and walk down to the garden.